Yes you are right – the slope of the Phillips curve is wrong. Normally one would expect that there was a positive relationship between real GDP growth and inflation, but for India the opposite seems to be the case. Higher inflation is associated with lower GDP growth. The reason for this obviously is that supply shocks is the dominant factor behind variations in Indian inflation. That should not be a surprise as nearly 50% of the consumption basket is food. A closer scrutiny of the Indian inflation data will actually show that the swings in Indian inflation primarily is a rainy phenomenon. Hence, the Indian monsoon and the amount of rainfall greatly influences the food prices and as a result short-term swings in inflation is primarily due to supply shocks in the form of more or less rainfall. Obviously if the Reserve Bank of India (RBI) was following a strict ECB style inflation target then monetary policy would be strongly pro-cyclical in India as negative supply shocks would push up inflation and down real GDP growth and that would trigger a tightening of monetary policy. This would obviously be an insanely bad way of conducting monetary policy and the RBI luckily realises this. The RBI therefore focuses on wholesale prices (WPI) rather than CPI in the conduct of monetary policy and that to some extent reduces the problem. The RBI further try to correct the inflation data for supply shocks to look at “core” measures of inflation where food and energy prices are excluded from the inflation data. However, the problem with use “core” inflation that it is in no way given that changes in food prices is driven by supply factors – even though it often is. Hence, demand side inflation might very well push up domestic food prices as well. Hence, it is therefore very hard to adjust inflation data for supply shocks. That said it is pretty hard to say that the RBI has followed any consistent monetary policy target in recent years and inflation has clearly been drifting upwards – and food prices can likely not explain the uptrend in inflation. On the other hand NGDP targeting provides the perfect adjustment for supply shocks and it would therefore be much better for the RBI to implement an NGDP target rather than a variation of inflation targeting. Unfortunately at the present the RBI don’t really officially target anything and monetary policy can hardly be said to be rule based. As I stressed in my earlier post on Indian monetary policy the RBI needs to move away from the present ad hoc’ism and introduce a rule based monetary policy. PS Monetary policy is certainly not India’s only economic problem – and not even the most important economic problem. I my view India’s primary economic problem is excessive interventionism in the economy, which greatly reduces the growth potential of the economy. PPS see also this fairly new IMF Working Paper on monetary policy rules. The conclusions are quite supportive of NGDP targeting. In my previous post I discussed how price controls likely have created a wedge between inflation measured by CPI and by the GDP deflator in Malaysia. That made me think – can we find other examples of this in the world? And sure thing the story of Argentina’s inflation over the last decade seem to be more or less the same thing. 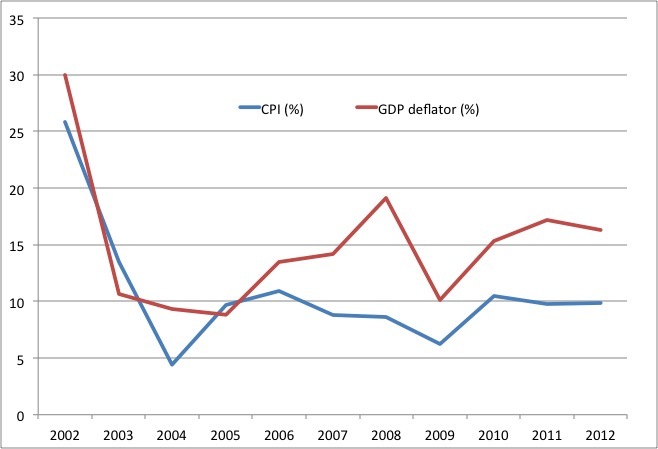 The graph below shows Argentine inflation measured by CPI and the GDP deflator since 2002. The difference is very easy to spot. It is very clear that until 2005 the two measures of inflation tracks each other quite closely, but from 2005 a difference opens up. So what happened in 2005? Well, the story is exactly as in Malaysia – monetary policy is inflationary and the government tries to curb inflation not by printing less money, but by introducing price controls. Argentine President Nestor Kirchner accused supermarkets of price fixing and said he would increase controls to slow a surge in inflation. Kirchner, in a televised speech at the presidential palace, said agreements between supermarkets such as Coto CISA SA and Hipermercados Jumbo SA, a unit of Chilean retailer Cencosud SA, to increase prices would lead to 12 percent inflation next year. In the 12 months through October Argentina’s consumer prices rose 10.7 percent, the fastest rate of increase in 29 months. “We will fight to defend consumers’ pockets,” Kirchner said, without specifying how he would slow price increases. The accusation underscores the government’s concern over quickening inflation, which may increase poverty in a country where almost 50 percent of the population cannot afford to cover their food and other basic needs, said economist Rafael Ber of Argentine Research brokers in Buenos Aires. Rising prices may also hurt the ability of Argentine producers to compete with foreign goods, Ber said. Kirchner has already attacked private companies for increasing prices. In April, he called on consumers to boycott The Royal Dutch Shell Group after the energy company increased prices. So there you go – price controls in response to inflation. That is never good news and the result has been the same in Argentina as in Malaysia (actually it is much worse) – shortages (See also my previous discussion of food shortages in Venezuela and Argentina here). Price controls always have the same impact – shortages – and if you think Malaysia and Argentina are the only countries in the world to make this kind of policy mistakes think again. Here is from the US, where a Republican governor these days is experimenting with price controls and the result is the same as in Argentina and Malaysia – shortages! PS it should be noted that the Argentine inflation data very likely is manipulated so there is more to it than just price controls – we also has a case of the books being cooked. See more on that here. Most inflation targeting central banks in the world are targeting inflation measured by the Consumer Price Index (CPI). However, if you want to target inflation CPI is probably the worst possible measure to focus on. Why? Because CPI includes both indirect taxes and import prices – something the central bank can certainly not control. If the central bank targets CPI it would in fact have to tighten monetary policy in response to negative supply shocks such as rising oil prices. Similarly the CPI targeting central bank would effectively be “forced” to tighten monetary policy in response increases in indirect taxes. Do you think this is foolish? Well, the ECB is doing it all the time…just think of the catastrophic rate hikes in 2011 in response to higher oil prices and austerity induced indirect tax increases across the euro zone. A much better measure to target – if you want to maintain an inflation targeting (I don’t…) – would be to target the so-called GDP deflator as this measure of prices by definition excludes import prices and indirect taxes. Targeting the GDP deflator therefore would reduce the problem of monetary policy reacting to positive and negative supply shocks. You might think that the difference between CPI and the GDP deflator is small and frankly speaking that used my view. However, the difference is far from trivial, which the case of Japan’s deflationary experience over the past 15-17 years clearly illustrates. The graph below shows the development in the Japanese price level measured by both CPI and the GDP deflator. While CPI indicates that the Japanese price level today is around 2% lower than in 1995 the GDP deflator is telling us that prices have dropped nearly 20% in the last 17 years. The difference is stunning and is certainly not something that should be ignored, but unfortunately I doubt that most central bankers are aware about just how great these differences are. It should of course be stressed that it is not normally so that CPI will be upward biased compared to the GDP deflator, but if tight monetary policy is leading to long periods of low or no growth and that forces the government to increase indirect taxes to improve public finances – as it has been the case in Japan – then there very likely will be an upward biased in the CPI compared to the GDP deflator. This conclusion obviously is highly relevant for the conduct of monetary policy in the present situation – particularly in the euro zone, where governments around Europe are increasing indirect taxes in a more or less desperate attempt to improve public finances. With the ECB’s focus on consumer prices (the HICP in the euro zone) rather than on the GDP deflator higher indirect taxes implicitly leads to tighter monetary policy – something which is hardly warranted in the present situation. Therefore if central banks want to continue targeting inflation they should at least change from CPI targeting to GDP deflator targeting – that would be a small, but important step away from repeating the Japanese scenario. PS This discussion is less relevant for the Federal Reserve as the Fed is targeting a the PCE core inflation measure, which is much closer to the GDP deflator than to CPI. “Monetary Policy and Japan’s Liquidity Trap” by Lars E. O. Svensson and “Theoretical Analysis Regarding a Zero Lower Bound on Nominal Interest Rate” by Bennett T. McCallum. These two papers I printed out when I was writting my recent post on Czech monetary policy. It is obvious that the Czech central bank is struggling with how to ease monetary policy when interest rates are close to zero. We can only hope that the Czech central bankers read papers like this – then they would be in no doubt how to get out of the deflationary trap. Frankly speaking I didn’t read the papers this week as I have read both papers a number of times before, but I still think that both papers are extremely important and I would hope central bankers around the world would study Svensson’s and McCallum’s work. “Regime Uncertainty – Why the Great Depression Lasted So Long and Why Prosperity Resumed after the War” – by Robert Higgs. My regular readers will know that I believe that the key problem in both the US and the European economies is overly tight monetary policy. However, that does not change the fact that I am extremely fascinated by Robert Higgs’ concept “Regime Uncertainty”. Higgs’ idea is that uncertainty about the regulatory framework in the economy will impact investment activity and therefore reduce growth. While I think that we primarily have a demand problem in the US and Europe I also think that regime uncertainty is a highly relevant concept. Unlike for example Steve Horwitz I don’t think that regime uncertainty can explain the slow recovery in the US economy. As I see it regime uncertainty as defined by Higgs is a supply side phenomena. Therefore, we should expect a high level of regime uncertainty to lower real GDP growth AND increase inflation. That is certainly not what we have in the US or in the euro zone today. However, there are certainly countries in the world where I would say regime uncertainty play a dominant role in the present economic situation and where tight monetary policy is not the key story. My two favourite examples of this are South Africa and Hungary. I would also point to regime uncertainty as being extremely important in countries like Venezuela and Argentina – and obviously in Iran. The last three countries are also very clear examples of a supply side collapse combined with extremely easy monetary policy. Furthermore, we should remember that tight monetary policy in itself can lead to regime uncertainty. Just think about Greece. Extremely tight monetary conditions have lead to a economic collapse that have given rise to populist and extremist political forces and the outlook for economic policy in Greece is extremely uncertain. Or remember the 1930s where tight monetary conditions led to increased protectionism and generally interventionist policies around the world – for example the horrible National Industrial Recovery Act (NIRA) in the US. I have read Higg’s paper before, but hope to re-read it in the coming week (when I will be traveling a lot) as I plan to write something about the economic situation in Hungary from the perspective of regime uncertain. I have written a bit about that topic before. “World Hyperinflations” by Steve Hanke and Nicholas Krus. I have written about this paper before and I have now come around to read the paper. It is excellent and gives a very good overview of historical hyperinflations. There is a strong connection to Higgs’ concept of regime uncertainty. It is probably not a coincidence that the countries in the world where inflation is getting out of control are also countries with extreme regime uncertainty – again just think about Argentina, Venezuela and Iran. “Morality and Monopoly: The Constitutional political economy of religious rules” by Gary Anderson and Robert Tollison. This blog is about monetary policy issues and that is what I spend my time writing about, but I do certainly have other interests. There is no doubt that I am an economic imperialist and I do think that economics can explain most social phenomena – including religion. My recent trip to Provo, Utah inspired me to think about religion again or more specifically I got intrigued how the Church of Jesus Chris Latter day Saints (LDS) – the Mormons – has become so extremely successful. When I say successful I mean how the LDS have grown from being a couple of hundreds members back in the 1840s to having millions of practicing members today – including potentially the next US president. My hypothesis is that religion can be an extremely efficient mechanism by which to solve collective goods problems. In Anderson’s and Tollison’s paper they have a similar discussion. If religion is an mechanism to solve collective goods problems then the most successful religions – at least those which compete in an unregulated and competitive market for religions – will be those religions that solve these collective goods problems in the most efficient way. My rather uneducated view is that the LDS has been so successful because it has been able to solve collective goods problems in a relatively efficient way. Just think about when the Mormons came to Utah in the late 1840s. At that time there was effectively no government in Utah – it was essentially an anarchic society. Government is an mechanism to solve collective goods problems, but with no government you have to solve these problems in another way. Religion provides such mechanism and I believe that this is what the LDS did when the pioneers arrived in Utah. So if I was going to write a book about LDS from an economic perspective I think I would have to call it “LDS – the efficient religion”. But hey I am not going to do that because I don’t really know much about religion and especially not about Mormonism. Maybe it is good that we are in the midst of the Great Recession – otherwise I might write about the economics and religion or why I prefer to drive with taxi drivers who don’t wear seat belts. Update: David Friedman has kindly reminded me of Larry Iannaccone’s work on economics of religion. I am well aware of Larry’s work and he is undoubtedly the greatest authority on the economics of religion and he is president of the Association for the Study of Religion, Economics and Culture. Larry’s paper “Introduction to the Economics of Religion” is an excellent introduction to the topic. The host of this blog, my good friend and colleague, on a daily basis reminds me “inflation is always and everywhere a monetary phenomenon” – and even more so this week where we have celebrated Milton Friedman’s birthday. I certainly do not need any convincing. On the contrary with this blog post I will present evidence that this is has indeed also been the case during the “The Great Recession”. Following the general New Keynesian Phillips curve formulation current inflation depends on the expected future inflation and the gap between current output and the natural level of output. If a larger share of prices is adjusted every period then current inflation will depend more strongly on the current output gap and vice versa. Using the New Keynesian framework it is possible to show that monetary policy during “The Great Recession” has had leverage over the development of prices both in the short run and the long run. Atlanta Fed’s monthly sticky price index will serve helpful in this. The sticky price index basically comprises the price components in the US consumer price index that are adjusted infrequently. Atlanta Fed furthermore publishes a flexible counterpart comprising the components in the US consumer price index that are adjusted frequently. 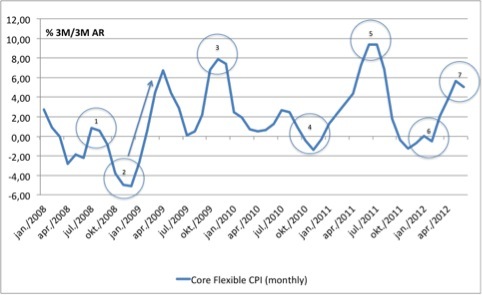 The first chart below depicts the development in US flexible core price inflation since 2008. I have used the three-month annual inflation rate only to get a smoother trend – it does not affect the main points of the analysis. I have marked seven turning points in the flexible core inflation that coincides with significant monetary policy shocks. 1) ECB surprises with a 0.25 %-point increase in interest rates, 2) Fed launches first round of QE, signals extended period of low rates, other major central bank cuts rates, Fed open dollar swap line, 3) Fed ends dollar swap line, 4) Bernanke mentions QE2, Fed launches QE2, 5) Trichet signals “strong vigilance”, ECB raises the interest rate twice, 6) ECB implements 3 year LTRO, 7) ECB tightens collateral rules. What this brief analysis shows is that frequently adjusted prices do react to changes in monetary policy. When monetary policy is eased, demand increases and subsequently prices increase and vice versa. In contrast, sticky price inflation does not only reflect the reaction to current monetary policy shocks, but also the expectations of the future development in demand. If demand is expected to increase then the sticky price inflation will increase as well. The second chart below illustrates US sticky core price inflation since 2008. What the sticky core price inflation chart shows is that the monetary policy shocks in the end of 2008 (QE1 and extended period language) briefly improved the outlook for the US economy, but it was not before Fed launched QE2 in the second half of 2010 that sticky core inflation started increasing reflecting expectations of increasing demand. 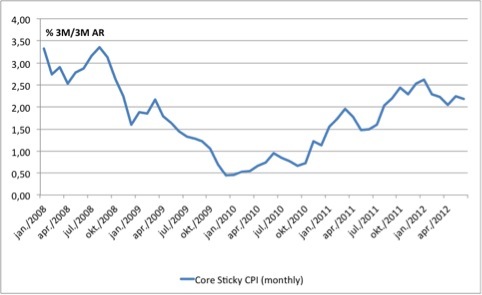 The chart further shows that sticky core inflation has started declining since the end of 2011. Hence, recently monetary policy has not done enough to maintain expectations of increasing demand. The above analysis shows that consumer prices do contain substantial information on the effects of monetary policy. And to sum up, yes Lars, you are certainly right – inflation is always and everywhere a monetary phenomenon! PS The Flexible and sticky prices series come from Federal Reserve Bank of Atlanta’s Inflation Project. It is no secret that Market Monetarists favour nominal GDP level targeting over inflation target. We do so for a number of reasons, but an important reason is that we believe that the central bank should not react to supply shocks are thereby distort the relative prices in the economy. However, for now the Market Monetarist quest for NGDP targeting has not yet lead any central bank in the world to officially switching to NGDP targeting. Inflation targeting still remains the preferred operational framework for central banks in the developed world and partly also in Emerging Markets. However, when we talk about inflation targeting it is not given what inflation we are talking about. Now you are probably thinking “what is he talking about? Inflation is inflation”. No, there are a number of different measure of inflation and dependent on what measures of inflation the central bank is targeting it might get to very different conclusions about whether to tighten or ease monetary policy. Most inflation targeting central banks tend to target inflation measured with some kind of consumer price index (CPI). The Consumer Price Index is a fixed basket prices of goods and services. Crucially CPI also includes prices of imported goods and services. Therefor a negative supply shock in the form of higher import prices will show up directly in higher CPI-inflation. Furthermore, increases in indirect taxes will also push up CPI. Hence, try to imagine a small very open economy where most of the production of the country is exported and everything that is consumed domestically is imported. In such a economy the central bank will basically have no direct influence on inflation – or at least if the central bank targets headline CPI inflation then it will basically be targeting prices determined in the outside world (and by indirect taxes) rather than domestically. Contrary to CPI the GDP deflator is a price index of all goods and services produced within the country. This of course is what the central bank can impact directly. Therefore, it could seem somewhat paradoxically that central banks around the world tend to focus on CPI rather than on the GDP deflator. In fact I would argue that many central bankers are not even aware about what is happening to the GDP deflator. It is not surprising that many central bankers knowingly or unknowingly are ignorant of the developments in the GDP deflator. After all normally the GDP deflator and CPI tend to move more or less in sync so “normally” there are not major difference between inflation measured with CPI and GDP deflator. However, we are not in “normal times”. A very good example of the difference between CPI and the GDP deflator is the Czech economy. This is clearly illustrated in the graph below. The Czech central bank (CNB) is targeting 2% inflation. 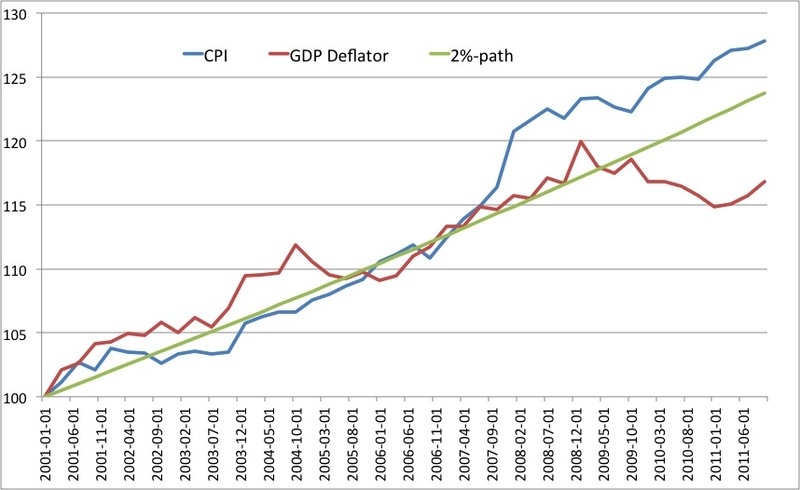 As the graph shows both CPI and the GDP deflator grew close to a 2% growth-path from the early 2000s and until crisis hit in 2008. However, since then the two measures have diverged dramatically from each other. The consumer price index has clearly moved above the 2%-trend – among other things due to increases in indirect taxes. On the other hand the GDP deflator has at best been flat and one can even say that it until recently was trending downwards. Hence, if you as a Czech central banker focus on inflation measured by CPI then you might be alarmed by the rise in CPI well above the 2%-trend. And this has in fact been the case with the CNB’s board, which has remained concerned about inflationary risks all through this crisis as the CNB officially targets CPI inflation. However, if you instead look at the GDP deflator you would realise that the CNB has had too tight monetary policy. In fact one can easily argue that CNB’s policies have been deflationary and as such it is no surprise that the Czech economy now shows a growth pattern more Japanese in style than a catching-up economy. In that regard it should be noted that the Czech economy certainly cannot be said to be a very leveraged economy. Rather both the public and private debt in the Czech Republic is quite low. Hence, there is certainly no “balance sheet recession” here (I believe that such thing does not really exists…). The Czech economy is not growing because monetary policy is deflationary. The GDP deflator shows that very clearly. Unfortunately the CNB does not focus on the GDP deflator, but rather on CPI. A easy fix for the Czech economy would therefore be for the CNB to acknowledge that CPI gives a wrong impression of inflationary/deflationary risks in the economy and that the CNB therefore in the future will target inflation measured from the GDP deflator and that it because it has undershot this measure of inflation in the past couple of years it will bring the GDP deflator back to it’s pre-crisis trend. That would necessitate an increase in level of the GDP deflator of 6-7% from the present level. There after the CNB could return to targeting growth rate in the GDP deflator around 2% trend level. This could in my view easily be implemented by announcing the policy and then start to implement it through a policy of buying of foreign currency. Such a policy would in my view be fully in line with the CNB’s 2% inflation target and would in no way jeopardize the long time nominal stability of the Czech economy. Rather it would be the best insurance against the present environment of stagnation turning into a debt and financial crisis. Obviously I think it would make more sense to focus on targeting the NGDP level, but if the CNB insists on targeting inflation then it at least should focus on targeting an inflation measure it can influence directly. The CNB cannot influence global commodity prices or indirect taxes, but it can influence the price of domestically produced products so that is what it should be aiming at rather than to focus on CPI. It is time to replace CPI with the GDP deflator in it’s inflation target. The article made me think about the impact of counterfeiting and whether thinking about the effects of counterfeiting could teach us anything about monetary theory. It should be stressed that my argument will not be a defense of counterfeiting. Counterfeiting is obviously fraudulent and as such immoral. Thinking about the impact of counterfeiting we need to make two assumptions. First, are the counterfeited notes (and coins for the matter) “good” or not. Second what is the policy objective of the central bank – does the central bank have a nominal target or not. Lets start out analyzing the case where the quality of the the counterfeited notes is so good that nobody will be able to distinguish them from the real thing and where the central bank has a clear and credible nominal target – for example a inflation target or a NGDP level target. In this case the counterfeiter basically is able to expand the money supply in a similar fashion as the central bank. Hence, effectively the nazi German counterfeiters in this scenario would be able to increase inflation and the level of NGDP in the UK in the same way as the Bank of England. However, if the BoE had been operating an inflation target then any increase in inflation (above the inflation target) due to an increase in the counterfeit money supply would have lead the BoE to reduce the official money supply. Furthermore, if the inflation target was credible an increase in inflation would be considered to be temporary by market participants and would lead to a drop in money velocity (this is the Chuck Norris effect). Hence, under a credible inflation targeting regime an increase in the counterfeit money supply would automatically lead to a drop in the official money supply and/or a drop in money-velocity and as a consequence it would not lead to an increase in inflation. The same would go for any other nominal target. In fact we can imagine a situation where the entire official UK money supply would have been replaced by “nazi notes” and the only thing the BoE was be doing was to provide a credible nominal anchor. This would in fact be complete monetary separation – between the different functions of money. On the one hand the Nazi counterfeiters would be supplying both the medium of exchange and a medium for store of value, while the BoE would be supplying a unit of account. Therefore the paradoxical result is that as long as the central bank provides a credible nominal target the impact of counterfeiting will be limited in terms of the impact on the economy. There is, however, one crucial impact and that is the revenue from seigniorage from iss uing money would be captured by the counterfeiters rather than by the central bank. From a fiscal perspective this might or might not be important. This also leads us to what surely is a controversial conclusion that a central bank, which is faced with a situation where there is strong monetary deflation – for example in the US during the Great Depression – counterfeiting would actually be beneficial as it would increase the “effective” money supply and therefore help curb the deflationary pressures. In that regard it would be noted that this case only is relevant when the nominal target – for example a NGDP level target or lets say a 2% inflation target is not seen to be credible. Therefore, if the nominal target is not credible and there is deflation we could argue that counterfeiting could be beneficial in terms of hitting the nominal target. Of course in a situation with high inflation and no credible nominal target counterfeiting surely would make the inflationary problems even worse. This would probably have been the case in the UK during WW2 – inflation was high and there was not a credible nominal target and as such had the nazi counterfeiting been “successful” then it surely would have had a serious a negative impact on the British economy in the form of potential hyperinflation. The discussion above in my view illustrates that it is important in separating the different functions of money when we talk about monetary policy and the example with perfect counterfeiting under a credible nominal target shows that we can imagine a situation where the provision of the unit of accounting is produced by a (monopoly) central bank, but where production the medium of exchange and storage is privatized. This is at the core of what used to be know as New Monetary Economics (NME). The best known NME style policy proposal is the little understood BFH system proposed by Leland Yeager and Robert Greenfield. What Yeager and Greenfield basically is suggesting is that the only task the central bank should provide is the provision media of accounting, while the other functions should be privatised – or should I say it should be left to “counterfeiters”. While I am skeptical about the practically workings of the BFH system and certainly is not proposing to legalise counterfeiting one should acknowledge that the starting point for monetary policy most be to provide the medium account – or said in another way under a monopoly central bank the main task of the central bank is to provide a numéraire. NGDP level targeting of course is such numéraire. A more radical solution could of course be to allow private issuance of money denominated in the official medium of account. This effectively would take away the need for a lender of last resort, but would not be a full Free Banking system as the central bank would still set the numéraire, which occasionally would necessitate that the central bank issued its own money or sucked up privated issued money to ensure the NGDP target (or any other nominal target). This is of course not completely different from what is already happening in the sense the private banks under the present system is able to create money – and one can argue that that is in fact what happened in the US during the Great Moderation. Zimbabwean central bank governor Gideon Gono has long held the title as the worst central banker in the world. However, I would suggest there might be a new candidate – Argentine central bank governor Mercedes Marcó del Pont. “We discard that financing the public sector is inflationary because according to that statement the increase in prices are caused by an excess of demand, something we do not see in Argentina. In our country the means of payment are adjusted to the growth of demand and tensions with prices must be looked on the supply side and the external sector”. UPDATE: Marcus Nunes has exactly the same story, but as usual Marcus was faster. Higher oil prices and higher bond yields – good or bad news? Recently (since December) we have seen US bond yields start to inch up and at the same time oil prices (and other commodity prices) have also inched up. This seem to be a great worry to some commentators – “Higher oil prices and higher bond yields will kill the fragile recovery” seem to be the credo of the day. This, however, reveals that many commentators – including some economists – have a hard time with basic demand-and-supply analysis. Said, in another way they seem to have a problem distinguishing between moving the supply curve and moving the demand curve along the supply curve. Oil prices can increase for two reasons. First, oil prices can increase because there has been a drop in the supply of oil or expectations that that will happen in the future – for example due to war somewhere in the Middle East. Or second oil prices can increase because of increased global demand due to easier monetary conditions globally (an increase in global NGDP growth). The first effect is a move of the supply curve to the left. The second is move on the supply curve. This difference is extremely important when we talk about the impact on the global economy – first is bad news and the second is good news for the global economy. What we need to know when we look at market action is to know why asset prices are moving and the best way to do that is to compare how different asset markets are moving. As I have shown in my previous post higher long-term bond yields is an indication of higher future growth in nominal GDP. Therefore, if both oil prices and long term bond yields are inching upwards then it is probably a pretty good indication that monetary conditions are getting easier – and NGDP growth is expected to increase. To further confirm this is might be useful to look at equity prices – if global equity prices also are inching upward then I think one can safely say that that reflect a shift in the global AD curve to the right – hence global NGDP growth is expected to increase. This actually seem to be what have been happening since the ECB introduced the so-called 3-year LTRO in December. On the other hand if oil prices continue to rise, but equity prices start to decline and bond yields inch down – then it is normally a pretty good indication that a negative supply shock just hit the global economy. That, however, does not seem to be the case right now. I continue to find it odd that so many economists are not able to use the most useful tool in the the economist’s toolbox – the supply-and-demand diagram. It is really pretty simple. However, how often have we not heard that rising inflation will hurt the consumer and kill the recovery? This is really the same story. 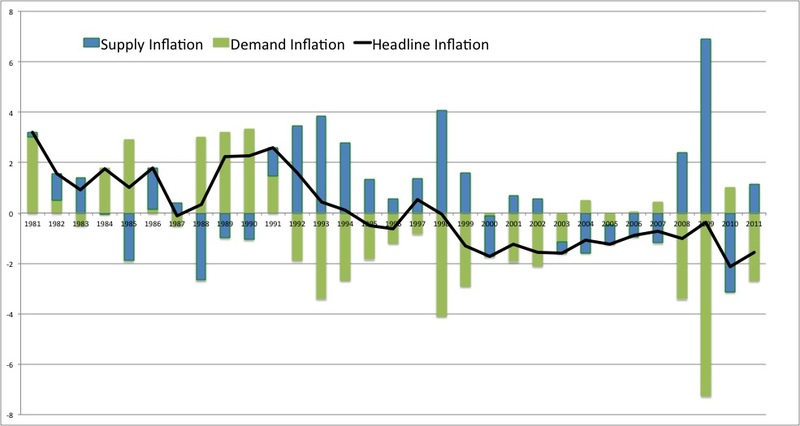 Inflation can increase because of higher nominal demand or because of lower supply. If demand is increasing – monetary conditions are becoming easier – then there really is no need to worry about the recovery. In fact we know that there is a close positive correlation between NGDP growth and RGDP growth in the short-run so any indication of higher NGDP growth in the present situation should really be expected to lead to higher RGDP growth. PS needless to say we can of course have a situation where both the supply curve and the demand curve is moving at the same time. This often happens when central banks are unable to distinguishing between demand and supply shock. Hence, if inflation increase due to a negative supply shock as was the case in 2011 and then central banks react by tightening monetary conditions as the ECB did in 2011 then you get both the supply curve and the curve moving…(The ECB obviously made this policy mistake because somebody forgot to draw supply-and-demand diagrams…). UPDATE: Our friend Jason Rave has a comment on a similar topic over at his blog Macro Matters. As me Jason is not worried about rising oil prices if they indeed do reflect higher global demand. I am getting a bit worried – it has happened again! I agree with Paul Krugman about something or rather this time around it is actually Krugman that agrees with me. In a couple of posts (see here and here) I have argued that the Japanese deflation story is more complicated than both economists and journalists often assume. In my latest post (“Did Japan have a productivity norm?”) I argued that the deflation over the past decade has been less harmful than the deflation of the 1990s. The reason is that the deflation of the 2000s (prior to 2008) primarily was a result of positive supply shocks, while the deflation of in 1990s primarily was a result of much more damaging demand deflation. I based this conclusion on my decomposition of inflation (or rather deflation) on my Quasi-Real Price Index. “A number of readers have asked me for an evaluation of Eamonn Fingleton’s article about Japan. Is Japan doing as well as he says? This is exactly my view. In terms of GDP per capita growth Japan has basically done as good (or maybe rather as badly) other large industrialised countries such as Germany and the US. This is pretty simple to illustrate with a graph GDP/capita for the G7 countries since 1980 (Index 2001=100). A clear picture emerges. Japan was a star performer in 1980s. The 1990s clearly was a lost decade, while Japan in the past decade has performed more or less in line with the other G7 countries. 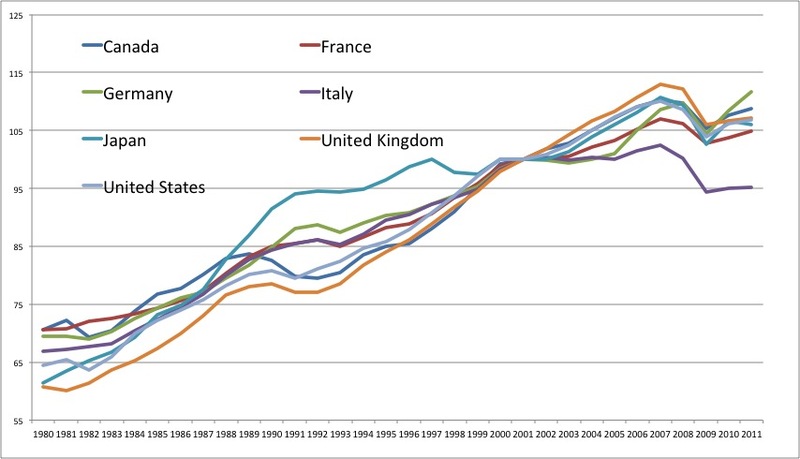 In fact there is only one G7 country with a “lost decade” over the paste 10 years and that is Italy. Milton Friedman famously blamed the Bank of Japan for the lost decade in 1990s and as my previous post on Japan demonstrated there is no doubt at all that monetary policy was highly deflationary in 1990s and that undoubtedly is the key reason for Japan’s lost decade (See my graph from the previous post). In 1998 Milton Friedman argued that Japan could pull out of the crisis and deflation by easing monetary policy by expanding the money supply – that is what we today call Quantitative Easing (QE). “The surest road to a healthy economic recovery is to increase the rate of monetary growth, to shift from tight money to easier money, to a rate of monetary growth closer to that which prevailed in the golden 1980s but without again overdoing it. That would make much-needed financial and economic reforms far easier to achieve. In early 2001 the Bank of Japan finally decided to listen to the advise of Milton Friedman and as the graph clearly shows this is when Japan started to emerge from the lost decade and when real GDP/capita started to grow in line with the other G7 (well, Italy was falling behind…). The actions of the Bank of Japan after 2001 are certainly not perfect and one can clearly question how the BoJ implemented QE, but I think it is pretty clearly that even BoJ’s half-hearted monetary easing did the job and pull Japan out of the depression. In that regard it should be noted that headline inflation remained negative after 2001, but as I have shown in my previous post Bank of Japan managed to end demand deflation (while supply deflation persisted). And yes, yes the Bank of Japan of course should have introduces much clearer nominal target (preferably a NGDP level target) and yes Japan has once again gone back to demand deflation after the Bank of Japan ended QE in 2007. But that does not change that the little the BoJ actually did was enough to get Japan growing again. I think a very important conclusion can be drawn from the Japanese experience. There is no such thing as the “New Normal” where deleveraging necessitates decades of no growth. Japan only had one and not two lost decades. Once the BoJ acted to end demand deflation the economy recovered. Unfortunately the Bank of Japan seems to have moved back to the sins of 1990s – as have the Federal Reserve and the ECB. We can avoid a global lost decade if these central banks learn the lesson from Japan – both the good and the bad.